Star Wars. Boy that's a fun franchise at the moment isn't it? Not exactly the type of place that you would want to tread. Civil War in the fandom, box office bombs, and creatives attacking the fans daily. Doesn't exactly make you want to pick up a comic based on the saga does it? 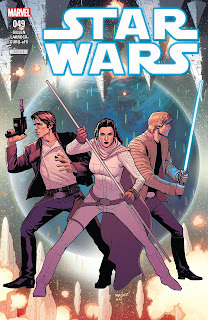 Luckily this series has been really improving in recent months, and if you fancy a slice of Star Wars with the big three, Han, Luke and Leia, then this might give you some light relief from modern-day tensions. This issue is another strong entry in the run-up to the 50th issue of this series. I am so happy to finally be able to say that this series, and its art is very good. I want to start with the artwork. I've been very critical of Larroca but in my review of the last issue, I noted how much he had improved and perfected a style that he was obviously aiming at. Now, there has been an amazing turnaround and these depictions of beloved characters are just so so good. 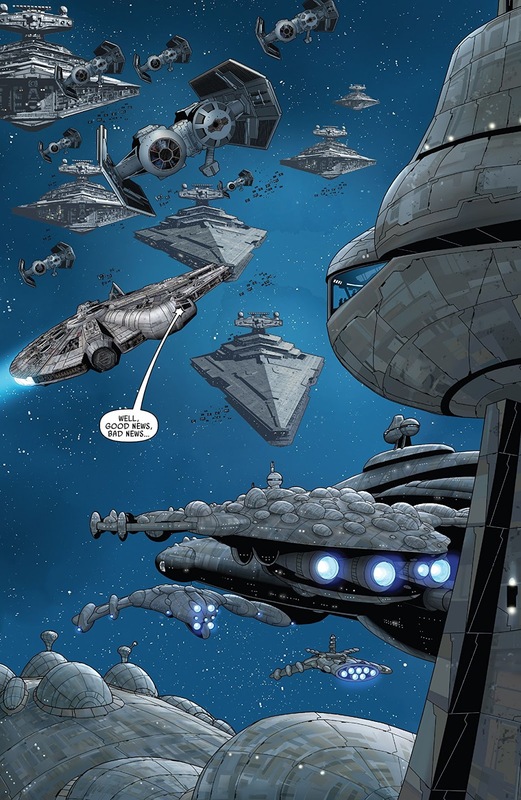 Add to that the fact that the space battles are brilliantly depicted and the events we see here show the integration of Mon Cala into the rebellion. These are scenes that we would always want to see in our Star Wars content, and short of a perfectly rendered animated series, or recasting Harrison, Mark and Carrie we aren't going to see these scenes on our screens. 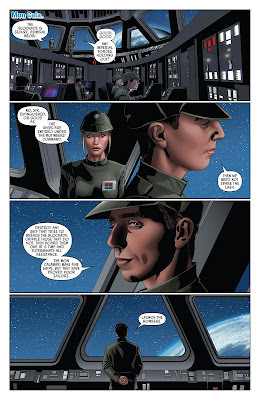 This is where this now perfected art style (which just wasn't right in earlier issues) is turning the series around. I'm so happy to see this. The writing as always is very strong from Gillen. The story, as mentioned above, is naturally intriguing. I'm a big fan of the Mon Calamari and I'm automatically going to be drawn into a series like this. 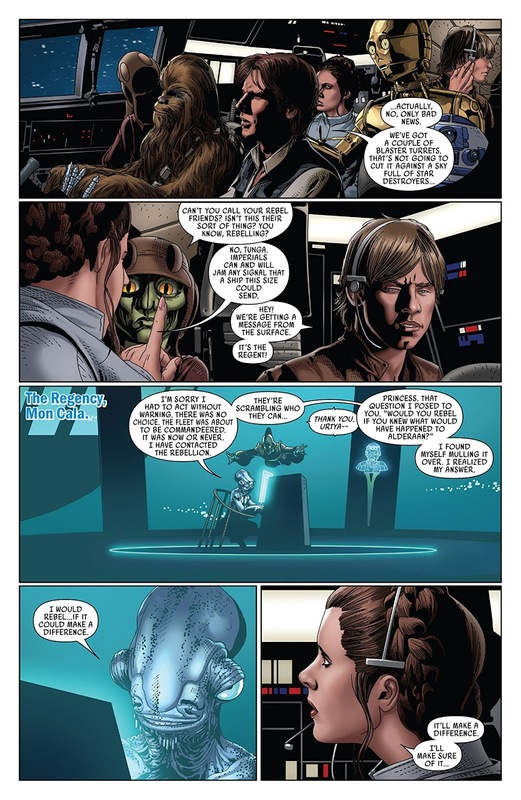 Plus we have a little bit of intrigue on the side, a bit of Leia diplomacy, a bit of Han sarcasm, and an ending which will chill you! Need I say more? Maybe I'm just relieved to find good Star Wars content. Maybe I'm happy that I'm able to write a good review instead of criticizing an artist. Maybe I'm excited that this book has hit a stride and is mining gold just as it hits a bumper 50th issue, Either way, it's nice to be entertained this much by Star Wars for a change.